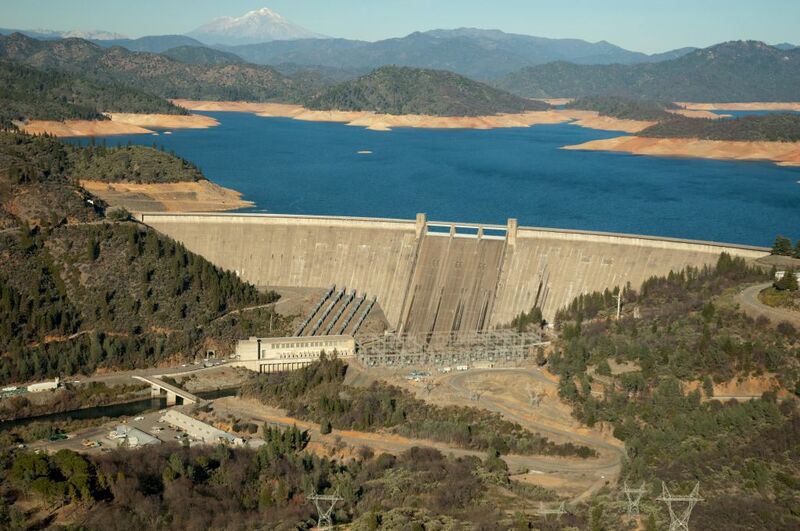 Aerial view of Lake Shasta & dam with low water. What’s more important: High-speed rail or water? Proponents of a proposed ballot measure would force voters to choose just that. The measure would redirect $8 billion in unsold high-speed rail bonds and $2.7 billion from the 2014 water bond to fund new water storage projects, while restructuring the oversight of those projects and prioritizing water usage in the state Constitution — a move critics say will be confusing and prone to legal challenges. Proponents of the measure are trying to capitalize on the unpopularity of the high-speed rail project and the popularity of the water bond to substantially boost the funding for water storage projects, which they say weren’t adequately funded by the 2014 bond. A Hoover Institution poll late last year said that 53 percent of respondents would favor scrapping high-speed rail in favor of water storage projects, with just 31 percent against. The water bond passed with 67 percent of the vote. The measure would also amend the state Constitution to prioritize the usage of water, making domestic usage the most important, then irrigation and then presumably environmental usage (which is not explicitly stated). But Tim Johnson, president and CEO of the California Rice Commission, says the proposed language “is extraordinarily unclear, very confusing,” and will likely end up in court. To illustrate, Johnson posed an ambiguous hypothetical situation: What happens when a farmer uses water to decompose straw, is that agricultural or environmental? The new water agency would divert decision-making authority on these water storage projects away from gubernatorial appointees, as mandated in the water bond, to a nine-member panel elected by the water districts of the four regions with one at-large member, which would likely shift power to agricultural interests over environmentalists. Johnson argues that the water bond water commission is set to allocate funds for storage projects around 2017 and a new structure would only delay the start of those projects. “It’s a totally different standard and a totally different group of people to present it to,” said Johnson. Johnson added that the measure is supported by just a few central valley “fat cats” who only want more water at the expense of everyone else. Bettencourt said there was broad coalition of supporters, with only a few larger farm interests and many small farmers. Since the beginning of the year, the California Water Alliance’s initiative fund has received $321,000 from donors. Funding came from 16 donors, with an average contribution of $20,000. Four contributions were under $10,000 and one large donation of $50,000 was from a political action committee that’s received many small donations. The measure is sponsored by Sen. Bob Huff, R-San Dimas, Board of Equalization member George Runner and the California Water Alliance. An earlier version of this article incorrectly stated that there was no available campaign finance data for the measure’s proponents. We regret this error.